Dylan is finally getting to the age where he is interested in TV. Although I am wary of him watching too much, I must admit that being able to sit him down for five minutes as I get on with something (sneak off to the kitchen to eat chocolate) is bliss and with the end of pregnancy becoming rather tiring it can be a real lifesaver! 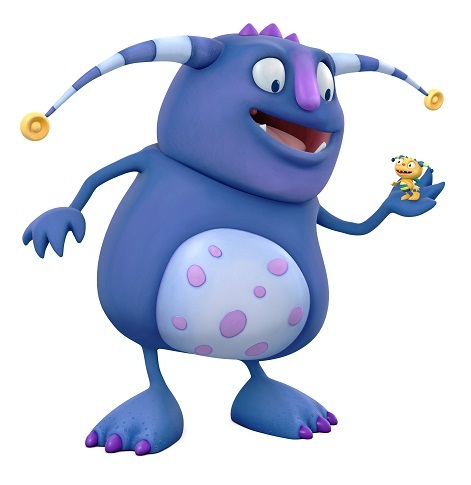 Henry Hugglemonster is a brand new program coming to Disney Junior and will be on every Friday (starting tonight!) at 5:50pm. We were sent a preview DVD of the show and it was a huge hit with the little guy. The characters are fun and colourful and the theme music is very addictive! Dylan loves having a little boogie along with it. We were also invited to meet Niamh, the creater of Henry and the Hugglewugs and had a mini masterclass at drawing our very own Henry. Dylan's may not have been very decipherable but he definitely got stuck in with some colouring, using every crayon he could get his hands on! Niamh started writing the book back in 2006 and we love it. It promotes reading together as there is so much to look at and not written as a traditional story and we often look at it together. The program is about a typical three child family and it is lovely to watch it with Dylan and see the mummy and daddy characters. Hopefully he will love it even more when he has his own little brother too! Set to premiere on Disney Junior UK on February 8th 2013 at 5.50pm before rolling out to audiences in more than 150 countries worldwide, the family series follows the adventures of fun-loving, five-year-old Henry Hugglemonster, the middle child in a happy, madcap close-knit monster family – the Hugglemonsters. Each story will transport preschoolers into the world of Henry Hugglemonster as he guides the young audience through the ups and downs of being part of a loving, bustling monster family. The 48 x 11 minute series (and two 30-minute seasonal specials) is developed from a series of books created by Ireland’s Children’s Laureate Niamh Sharkey called I’m a Happy Hugglewug and published by Walker Books. The illustration style of the books is retained in the series’ animation. Brenda Blethyn, OBE, has been cast in the role of Ernestine Enormomonster, who is married to Eduardo Enormomonster, voiced by Brian Blessed. Eduardo and Ernestine Enormomonster’s daughter, Estelle, is best friends with Henry Hugglemonster, and together the Enormomonsters are always happy to lend an enormous hand whenever someone in Roarsville needs some help. Blethyn, whose work has spanned theatre, television and film, has received various award nominations throughout her career including two Academy Awards*, two Emmy Awards and three Golden Globe Awards, winning one, as well as a BAFTA. British actor Brian Blessed who is best known for his hearty, king-sized portrayals on film and television, is one of England’s most treasured and highly respected actors. Geri Halliwell, Brenda Blethyn and Brian Blessed will feature in the English-speaking territories where Disney Junior airs including the UK, U.S., and South Africa. The series is directed by Emmy Award winning director Norton Virgien (Rugrats, Doc McStuffins), the lead writer is Sascha Paladino (Wonder Pets, Ni-Hao Kai-Lan) and the series is produced by Gillian Higgins (Doc McStuffins, Octonauts). Created in May 2007, Disney’s London production hub drives the investment in and development of long form animation outside of North America, for both European and global distribution. It has already achieved great success with series such as UK-produced Jungle Junction, which has proved to be a huge hit with Disney Junior audiences internationally. The series has now rolled out in more than 150 countries worldwide winning a BAFTA nomination and more than 23 million viewers in EMEA alone. We have it all set up on series record as I can see Henry Hugglemonster becoming a firm family favourite in this house! I completely forgot about those bits! I have a little list on top of my bag to add my make up bag and hair straightners when we need to leave. I feel so much more like me with a free essays online little eyeliner on! Will be adding some socks now too!